Happy New Year! Tammi and I just got back from Louisiana so the pie adventure was pushed to the weekend. It was also Olivia’s birthday on 12/31 so fun, games and parties were to be had. 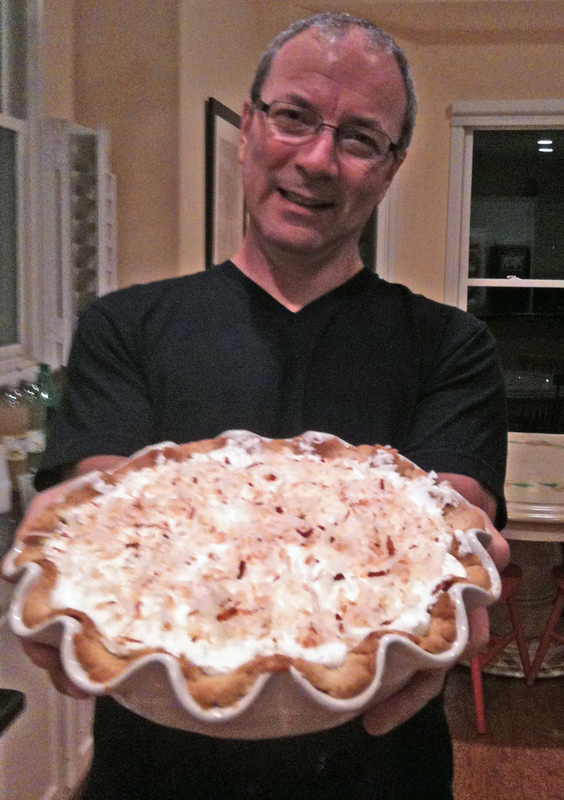 I decided to make the pie the day of Olivia’s birthday party at our house, figuring it wouldn’t take too long. Wrong! And cooking while 8-10 screaming 10 and 11 year olds, (along with parents coming and going) added an element of mild frenzy to the whole exercise. About 2 hours prior to the party I went shopping for the ingredients I needed. Locating the supplies was slightly confusing. Mostly because I couldn’t figure out where corn starch and coconut milk were on the aisles of the local HEB. coconut milk was in the condiments and international food aisle. Corn starch, I thought, would be somewhere near the flower. It wasn’t. Combine the flour and salt in a mixing bowl. Cut the vegetable shortening and butter into small chunks and add to the flour mixture. Blend the mixture until it has the consistency of wet sand with a few pea size pieces of butter and shortening remain. Mmmmmm, sand. Using a fork or whisk, beat the egg with the vinegar and water. Slowly pour over the egg mixture over the flower, stirring until the mixture is moist. The dough should stick together and hold the shape of a ball. Divide the dough into two, and wrap in plastic wrap. Chill in refrigerator a minimum of 30 minutes. For this pie, only one piece of the dough is needed. I used the other to fill in any cracks to the dough I put in the dish. Roll dough from center to edge until crust is desired thickness (usually 1/8″ thick) and at least 1″ wider than pie plate. It the dough sticks to the rolling-pin, try placing cellophane over dough and then roll it out. Remove the plastic wrap and transfer to pie plate by rolling the dough onto the rolling-pin and then positioning it over the plate. If the crust is sticking to the rolling-pin surface, carefully separate it by sliding a sharp knife or spatula between the crust and rolling surface. Carefully press the dough into the pie plate. If cracks appear, use lightly floured fingers to push the seams back together. Preheat the oven to 425 degrees. Prebake for 15 minutes. The dough will last up to 3 days. If you want to freeze the extra crust, roll out the dough and line the plate you’ll be using. Once the crust is frozen, remove from you plate and freeze in a large freezer bag. It’ll last for up to 3 months. Start by spreading the 1/4 cup sweetened flaked coconut onto parchment lined cookie sheet and bake at 375 degrees F for 15 minutes. Set aside for topping. Using a fork, beat the egg yolks in a small bowl. Combine the sugar, cornstarch and salt in a larger saucepan. Slowly whisk in the milk and coconut milk over medium heat. Continue to whisk until the mixture comes to a boil. Cook for 1 minute, still whisking. Quickly transfer half the milk mixture to the bowl holding the egg yolks. Whisk to combine, then return the egg and milk mixture to the saucepan. Return to a boil and cook for 1 minute, whisking continuously. Remove from heat. Stir in the butter, vanilla and unsweetened coconut into the milk mixture. If, by some accident, you purchase even more sweetened coconut flake, take heart, it just makes the pie taste that much sweeter… Pour custard mixture into the pie crust. Cover with plastic wrap to prevent skin from forming on the top of the custard. Let it cool and then refrigerate for 2 hours. Once set, beat the cream, confectioners sugar and coconut extract using and electric mixer until stiff. Remove the pie from the refrigerator. Remove the plastic wrap and top custard with whipped cream. Garnish with the toasted coconut. The girls who stayed for Olivia’s slumber party gave it a thumbs up, and my wife also like it very much. Myself? This one is definitely one of my favorites. The custard held firm, and the crust was flaky and didn’t turn to mush once I poured the custard. In the new year, I now only have 46 more pies to bake. This is my resolution. This entry was posted in Coconut Pies, Cream Pies and tagged Baking, Coconut cream, Coconut Pies, Dessert, Pie, Recipe by pieofthebeholder. Bookmark the permalink. I am impressed. Are you starting a pie business? Maybe just special orders?